I have a theory that all of us have something about us—where we think we are right; and anyone who does anything differently is just plain wrong. And I don’t mean the big philosophical theories and large mumbo jumbo, I mean like how you fold your laundry or if it makes more sense to flick through the channels to find something to watch rather than find something on the guide and then stick to it. I believe these beliefs are the cause of most roommate disagreements in college and a great deal of relationship disagreements. At this point in my life, I ‘m aware of only two of these beliefs—but I’m sure I have others. The first, relatively minor, perhaps, is how to make a real cup of tea—learned in my junior year in college in Leeds, England. The second is that every ordination service should have this text—in other words, this text about Jesus sending people out into the world to preach the Kingdom of God, should be the example to which all our seminary students and young pastors strive to imitate. This—Jesus has just taught about his having to be betrayed and killed. (Luke 9:44). He’s taught them that the first shall be last and the last shall be first (Luke 9:48). They encountered opposition in Samaria, Samaritans did not welcome Jesus. He told his followers that he has no place to lay his head and that they must not put their hand back to the plow once they decide to serve the Kingdom of God. Amazing he found even 70 people isn’t it? Symbolic number , 70. In Numbers 11, Moses chose 70 elders to assist him in judging legal disputes among the Israelites. According to Deuteronomy 10, seventy patriarchs went down to Egypt during the famine prior to the book of Exodus. Seventy is also the traditional number of nations descended from Noah (Gen 10).
. . . in pairs. . . , ‘The harvest is plentiful, but the labourers are few; therefore ask the Lord of the harvest to send out labourers into his harvest. Notice what Jesus actually says here verses what we think he says. In our secular skeptical age, we ask, “How come more people don’t come to church?” Jesus doesn’t say that at all. He assumes that there are people out there who could come in, but it strikes me that Jesus doesn’t lament the fact that there are people outside of the religious community who are having a picnic or reunion or golf outing or shopping experience or pool time. No! He says, instead, pray for more missionaries! We often pray for the conversion of people and we often pray for full pews. We often pray for our ministries and congregations and settled pastors. Yet, how often do we pray that God will multiply the missionaries, the evangelists? Perhaps we’re a little afraid that if we pray for more laborers, we might be tapped on the shoulder, handed our draft papers to enter the Lord’s army. More bad news. This is not the Joe Paterno, Knute Rockne, Mike Tomlin pep talk. If someone tells you that you are being sent out like a lamb among wolves, no qualification, no comfort or soothing, you are going to rightly think that sounds like a dangerous task. Lambs are not known for their defensive skills. Wolves are. Jesus is setting some of the 70 up to fail! Do you really want your disciples hampered by not having the tools to do their jobs to the best of their ability? Come in and program this computer—with no training. Here, be a life guard, without any water skills. Yet in God’s mysterious wisdom, what seems like folly in any other area of life, is mastery. 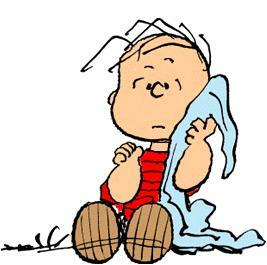 God wants us—his harvesters–to throw away every security blanket—remember Linus?—that keeps us from the gospel. In other words, to depend on God, not money, not success, not program. A minister friend of mine once reported how he had seen in his 40 years of ministry trends which were supposed to ‘save’ the local church, i.e. a church library, slogans, mission statements, then it was banners. Each is a security blanket. . The church, my friend would say, is its own best selling point–we need only rely on God, no other security blankets. How often we covet the resources of wealthy churches, churches with TV stations—when we have all we need according to Jesus? This is not what Jesus says, the time is now. And go out into the harvest with what you have, even if it is nothing. — Carry no purse, no bag, no sandals; and greet no one on the road. Why? What do we need? Whatever house you enter, first say, “Peace to this house!” And if anyone is there who shares in peace, your peace will rest on that person; but if not, it will return to you. Remain in the same house, eating and drinking whatever they provide, for the labourer deserves to be paid. Greet people in peace. If not, move on. Eating and drinking with in this day meant acceptance. A family’s guest is never again a stranger. Cure the sick who are there, and say to them, “The kingdom of God has come near to you.” The Kingdom of God is a central theme in Jesus’ preaching, and that in each instance it is not only a reference to a future afterlife, but something emerging there and then in that very moment. And the sin that pre-empts the Kingdom near you? Lack of Hospitality. But whenever you enter a town and they do not welcome you, go out into its streets and say, “Even the dust of your town that clings to our feet, we wipe off in protest against you. Even then, even if you are rejected and the disciples wipe off their feet in protest, what does Jesus say? Evenso the Kingdom of God has come near. My friends, we live in a blessed time because it is close to the situation of Luke’s Gospel. We don’t have all the resources we think we need but we have enough. We can announce that TODAY, the Kingdom of God has come near. Amen.